Do you have any cases where the client has medical issues? Or, a situation where the client was rated or declined for medical reasons? If you've come across these - likely more times than you want - consider these situations a great opportunity. A lot times your client has already been told "no" or has been declined. The feeling leaves them frustrated about the circumstance and disappointed with the turnout. They're left with believing they cannot be insured at all. Imagine if you can walk in and present them with a summary of all of the research done - replies from carriers, proposed illustrations, etc. - and show them that they do have options available when it comes to being insured. Do you think you would be their hero? You will. And it all starts with R.A.T.E. The underwriting process has always seemed to be an unpleasant experience; declining applications and receiving poor ratings. 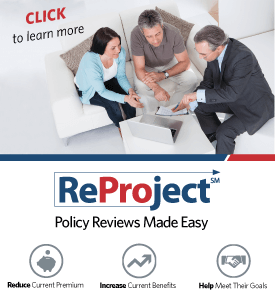 LifePro has created a complete system that will turn this negative situation into a positive one. 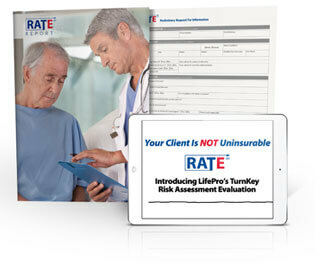 Announcing RATE; a risk assessment turnkey evaluation. All you have to do is obtain basic information and brief medical records and we do the rest for you; shopping different carriers, negotiating class rankings, providing client-friendly illustrations and much more! Think how many of your cases have been rated or declined; losing out on thousands of dollars. RATE has been able to turn these cases into paid cases. Even if you have had cases declined in the past, our impaired risk experts have the knowledge of what it takes to get those cases approved. Your client is not uninsurable! 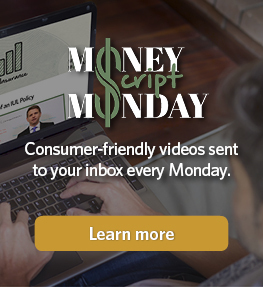 The RATE marketing program is for the independent financial professional who has a client with medical issues and doesn't know how to start the conversation on what to collect to receive an accurate quote. Another situation is if the advisor has had any rated or declined cases in the past and would like to see if there are alternative options for the client. Present your clients with an easy-to-read, professional-looking summary of the insurance carriers evaluated with vibrant illustrations and graphs. The professionalism portrayed will show the client that you’ve put the hard work and time in to earn their business. "Your organization and everyone in it continually exceeds my every expectation while making tremendous efforts to grow my business." Click the button below to receive "The Questions You Need to Ask About Medical Impairments" guide!